Today Adobe announced the release of Lightroom CC 6.7. It’s important to note before I go into the specs of this version, that it requires Mac OS 10.10 or greater and has compatibility fixes for Mac OS 10.12 (Sierra). I recommend updating to this version of Lightroom before updating to Sierra, just to play it safe. And because this version of Lightroom on Mac requires OS 10.10 or greater, take a look at your “About This Mac” to make sure your operating system is running at least 10.10. Also note that Adobe Camera Raw got an update to version 9.5.1 as well. 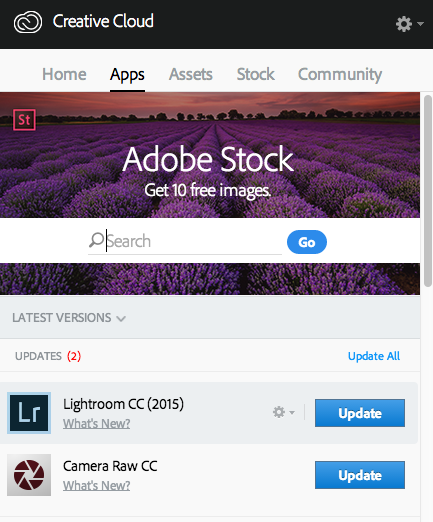 The Lightroom update will appear in the Apps tab of your Creative Cloud app. Click the gear on the top right and choose preferences if you need to log in to your Adobe account. Below is an overview of supported cameras and lens profiles and other fixes and improvements. Some other highlights are support of iPhone and iPad camera raw and improved performance when using the white balance sliders. Smart Previews are a way to develop photos without having access to the original images. It’s been discovered that Lightroom performance is faster in the Develop Module when using Smart Previews and keeping the hard drive where the originals are located disconnected from the computer. 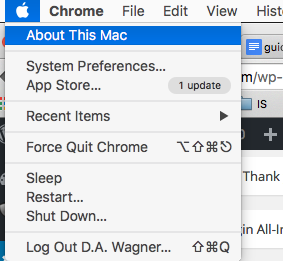 Because of this discovery, the guys at Adobe added a Preference in the Performance tab that will always use Smart Previews when available without having to disconnect your external hard drive. With Apple’s iOS 10 update, you can shoot camera raw capture (DNG) a few of the newer iPhones and iPads, however it’s only available with third party apps. The good news is, the Adobe Lightroom Mobile 2.5 update unleashed the DNG raw capture feature on those iPhones and iPads. Those Apple devices that support camera raw are listed below.